eyemist | Bio Logic Aqua Research® Technologies International, Inc.
Nature’s Tears EyeMist has been available on Drugstore.com since 2004 and the company’s nine year association with Drugstore.com will continue for the foreseeable future. The company believes that Drugstore.com is an outstanding and reliable organization that offers Natures Tears® EyeMist® customers an easy, problem-free purchasing option. Bio-Logic Aqua Research’s strategy of marketing Natures Tears® EyeMist® through Drugstore.com, and its subsidiaries, Beauty.com and VisionDirect.com, has been in place since 2004. Internet marketing offers a 24-hour, stay-at-home convenience to customers that is not available in stores. Natures Tears EyeMist has received 44 customer reviews on Drugstore.com, with an overall rating of 4.5 stars out of 5. The company offers the following tips when using Natures Tears® EyeMist®: (1) When applied correctly, the 100% water mist does not run eye makeup or make the face damp. (2) Humidifying the skin of the face and eyelids is an essential component of the product’s dry eye relief strategy. (3) Natures Tears® EyeMist® contains no formulated chemicals and is in no way “merely eye drops applied as a mist.” (4) Only 3 to 5 nanoliters of the water mist needs to penetrate the eyes’ protective tear film to successfully hydrate the eyes and bring the tear film’s water content back up to normal. The eye’s basal tear film is 98 percent water. When the tear film’s water content drops, dry eye complaints begin. Common complaints include itching and burning eyes, eye strain, headache, fatigue and blurred vision, Nature’s Tears® EyeMist® represents a new discovery in the relief of dry eye complaints. The product supplements lost tear film water by utilizing the company’s trade secret, 100% all-natural, pH correct tissue culture grade water, applied as a fine mist with a personal, portable, hand-held humidifying device. Bio-Logic Aqua Research Founder Sharon Kleyne owns US and worldwide patents on the mist application technology used in Natures Tears® EyeMist®. ©2013 Bio-Logic Aqua Research. All rights reserved. Bio-Logic Aqua Research recently expanded sales of Natures Tears® EyeMist® for the first time, to a wide range of overseas markets, utilizing Amazon.com. The product had previously been available only in the United States, Canada and to a limited extent in South Korea. Under the new agreement, Amazon.com will now ship from their US warehouses to individuals in any participating country. According to Kleyne, Amazon.com can offer overseas consumers shipping costs significantly below what Bio-Logic Aqua Research is able to charge. I have given a sample of Nature’s Tears EyeMist, from Bio-Logic Aqua Technologies, to 10 to 15 patients a day for the last nine years. All these patients had come to my ophthalmology office with complaints of dry, burning or irritated eyes and/or blurring or tearing while reading or using computers. The mist was given out along with a sample of artificial tear drops from various manufacturers. I am an enthusiastic investor in, and Medical Director of, Bio-Logic Aqua Technologies because of the feedback from these patients. To understand this feedback, one must realize that when addressing the very common complaints of burning, blurring, tearing, and irritated eyes, we are primarily treating subjective patient complaints and not objective ocular surface disease. These complaints are often the only reason that the patient called for an appointment. All patients were given a sample of artificial tear drops with their mist sample and many had tried one of more conventional products in the past, so much of the feedback was in comparison to the myriad of other products on the market. The most remarkable result of this informal sampling survey was patient enthusiasm. Feedback on all other drop, ointment, eyewash and nutritional supplement products for dry eye has always been lukewarm at best: “Better than nothing,” “helps for a little while,” “or “doesn’t help.” Nature’s Tears EyeMist inspired such comments as, “I love that stuff” or “it’s better than all the other products”. Contributing to this patient enthusiasm is the absence of burning, stinging, and blurring. All chemically compounded artificial tears cause these problems in certain patients due to the thickening polymers and chemical nature of these products. Because Natures Tears Eye Mist is not a compounded product and contains only water, water pure enough to serve as a superior base for tissue culture media, this product cannot and does not cause burning, stinging, and blurring. Prior to the introduction of this product, I never had an enthusiastic response to any dry eye product. Ophthalmologists and optometrists had been hoping for a better product because these unhappy patients are a several times a day reality in our practices. Besides patient enthusiasm for the relief of symptoms offered by the mist, convenience of administration must be considered. One cannot safely instill artificial tear drops while driving on a busy freeway but misting in this situation is easy and not dangerous. None of the drops or ointment products offers the possibility of frequent, convenient dosing, and frequent dosing is the key to relief in many patients. Please note that Nature’s Tears EyeMist was offered to patients in addition to conventional products, not as a sole alternative. Many patients ultimately used both drops and mist in a way that maximized their relief. The polymer or gum component in drops results in a longer duration of relief and the mist is quick, easy and effective between drops. I have found that Nature’s Tears EyeMist is an important complement to, and not a replacement for the other products on the market. Sharon Kleyne Talks about Dry Eye Education, Dry Eye Products and Nature’s Tears® EyeMist®, as heard on Apple iTunes, World Talk Radio, Voice America and Green Talk Network and Amazon.com. Sharon Kleyne, Founder of Bio Logic Aqua Research, announced the latest research on computers, eyemist and dry eye. More education can be found on Amazon.com and Apple iTunes. Nearly everyone who regularly uses a computer experiences occupational computer eye strain symptoms. Dry eye and computer eye strain (also called computer dry eye) are a growing health crisis caused by a combination of computers, indoor and outdoor air pollution, and increasingly dry air. The phrase “dry eyes” is Googled, on average, 246,000 times a month. As part of Sharon Kleyne’s interest in water and health, the creator of the Sharon Kleyne Hour Power of Water radio talk show and the product Nature’s Tears® EyeMist® has been researching the latest recommendations for prevention of dry eye and computer eye strain. Everyone who works daily at a computer, according to Shaorn Kleyne, should think about the following questions. *Do you work at a computer all day and again at night? *Do you drink enough water a day? *Do you keep an eye mist such as Nature’s Tears® EyeMist® near your computer and apply it frequently? *Are you proactive in keeping eyes, and the air around your desk, moist and humid? *Do you keep eye drops beside your computer, use them frequently and worry about exceeding the recommended daily dosage? *Do you work in an office with forced-air heating and cooling, fluorescent lighting and sealed windows? *Is the air outside your office polluted? *Do your eyes feel good in the morning but bother you later in the day? *Do you get enough sleep? *Are you constantly stressed and rushed? *Do you get sleepy during the day? *Do you drink coffee, smoke or eat sugar snacks while working? *Is your productivity and attention span decreasing? *Do your shoulders or neck get sore when you sit at the computer? Do you get frequent headaches or allergies? *Are you overweight or gaining weight? *How often do you eat dark green leafy vegetables? What about carrots? Do you eat fish regularly or take omega-3 supplements? *How often do you take long, soaking baths? *Are there anti-stress activities in your daily routine? How often to you take work breaks? How often do you rest your eyes? *Are you bothered by screen glare? Have you positioned your computer to reduce glare? From your chair, do you look up, down or straight across at the screen? Some of the above questions (such as “do you drink coffee”) suggest possible measures for proactive prevention. Others do not. Mrs. Kleyne has made numerous discoveries regarding computer eye strain, dry eye, lifestyle, water, health and nutrition and shares them in Part Two of this Two Part Series. Listen to the Sharon Kleyne Hour Power of Water Mondays, 10 a.m., PST/PDT. The syndicated show is heard on Voice America/World Talk Radio, Green Talk Network and Apple iTunes. Go to http://www.SharonKleyneHour.com for summaries and replays of past shows. Also visit http://www.naturestears.com, http://whatistheeye.wordpress.com, “Nature’s Tears EyeMist” on Facebook and “Bio-Logic Aqua” on Twitter. Sharon Kleyne, internationally syndicated radio talk show host and Bio-Logic Aqua Research Founder, appeared at Natural Products Expo West 2011. She answered questions about dry eye and dry air, and demonstrate her newly patented all-natural organic eye mist product, Nature’s Tears® EyeMist®. Sharon Kleyne’s appearance at Natural Products Expo West 2011 was sponsored by Health Enterprises, Inc., booth #5610. She appeared from 11 a.m. to 2 p.m. on Saturday, March 12, 2011. Natural Products Expo 2011, Anaheim Convention Center, Anaheim, CA, March 8-13, 2011. Nature’s Tears EyeMist is the only 100% water, 100% pure, all-natural organic product sold in any pharmaceutical eye care section of any major drug store. No other dry eye product is as natural, pure or biocompatible with the human eye and tear film. Bio-Logic Aqua Research is the only company dedicated exclusively to all-natural water, health and wellness research and education worldwide (“Earth’s Human Mission”). Dry eye, in the United States and worldwide, is becoming a crisis. Eighty-percent of eye doctor patients complain of dry eye symptoms such as itching, burning, blurred vision, red eyes, headache and fatigue. The importance of the eyelid in natural products marketing alternatives has only recently been recognized. Natural products researchers are discovering that if the tear film is dry, the eyelids will also be dry. This is especially true in chronic dry eye and in people who live in areas of extreme dry air or air pollution, or who spend a lot of time indoors. Blink rate: Dry eye and tear film dehydration can result from a low rate of eyelid blinking. It may also result from an excessively high blink rate. Eyelid health: The majority of dry eye patients have unhealthy and dry eyelids (blepharitis). Blink rate. When using a computer, the eyelid’s blink rate, normally 15 to 20 blinks a minute, can slow to three blinks a minute. This is a primary cause of “computer vision syndrome” (CVS). A low blink rate increases exposure of the tear film to the air, increasing the amount of tear film water lost to evaporation. Tear film evaporation and dehydration can also be worsened by a rapid blink rate. A normal tear film consists of a thin lipid (oil) layer that helps slow evaporation from the much thicker aqueous (water) layer underneath. Because blinking “wipes” the tear film and moves the layers, a rapid blink rate, like a low blink rate, can increase water evaporation and the potential for dehydration and dry eye. Eyelid health. Researchers and individuals involved in natural products marketing, are discovering an enormous mutual influence between the tear film and eyelid health. Dry eye is frequently accompanied by blepharitis (eyelid inflammation), with red, inflamed, flaky, burning, itching and dry eyelids. When attempting to alleviate dry eye with an alternative all natural product, it is important to add supplemental water not only to the tear film but to the eyelids. A new paradigm in eye moisture for natural products marketing. For those at high risk for dry eye, both the tear film and the eyelids can be kept hydrated with an all-natural, pure water eye mist supplement. 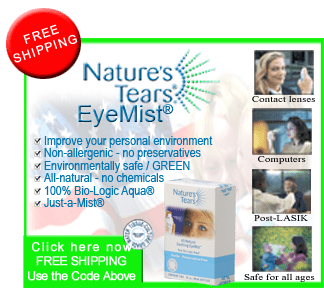 Nature’s Tears EyeMist, from Bio-Logic Aqua Research, is a patented new alternative approach to natural products marketing for all-natural eye and eyelid hydration. The mist naturally supplements the tear film to soothe dry eye and dry eyelid – no matter how often you blink. Nature’s Tears EyeMist contains 100% all-natural tissue culture grade water. The mist is applied in seconds and is non-allergenic; saline, chemical and preservative free. The product instantly hydrates dry eyes and dry eyelids to supplement tear film and eyelid moisture. Nature’s Tears EyeMist – a new paradigm that within a decade, will be found beside every computer. Bio-Logic Aqua Research is continuing to investigate the relationship between dry eye, refractive eye surgery and tear film flooding from the application of formulated eye drops, al to develop alternative all-natural products. Bio-Logic Aqua Research – Rogue Media Division. 5001 Lower River Road, Grants Pass, OR 97528; 1-800-FOR-MIST (367-6478); RogueMedia@biologicaquaresearch.com. The All-Natural, Patented Alternative to Eye Drops for Dry Eye Disease and Tear Film Hydration. Nature’s Tears® EYEMIST® All-natural hydration for dry eye. Just-a-MIST® Instantly adds all-natural moisture (water) to the eyes’ tear film – Without eye drops! * EYE MIST® – The ONLY all-natural alternative for: Dry eye disease, computer vision syndrome, red eye, burning eyes, itching eyes, eye allergies, eye fatigue, eye irritation from perspiration, tear film dehydration and tear film moisture loss. Nature’s Tears® EYEMIST® – All-natural, 100% water. EYEMIST® alternative for dry eye, dry air, dry tear film, dry eyelid hydration and computer vision syndrome. 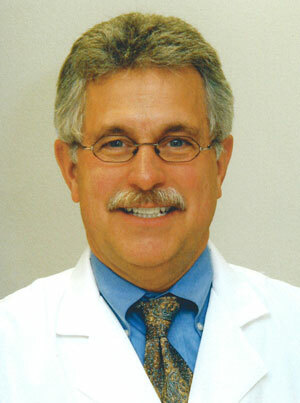 For more information, see “Eye Care News” at left, or visit our popular blog, WhatIstheEye.wordpress.com. And remember: Someone goes blind every 4 seconds * 1.6 billion people lack abundant and safe water * 100 US cities are listed as “Dry Eye Hot Spots” * 35 million people will be blind by 2030, and … YOU HAVE THE POWER TO PROTECT YOUR VISION!